Marshmello is no stranger to Fortnite, having played with Ninja at E3. While this event made sense for a game that embraces celebrities and in-game events, it made no sense to me, an old man whose last live concert was a reunion tour for 90s punk/emo band Jawbreaker that annoyed me for not starting until 9:30pm. I thought EDM musicians who wear funny masks was a joke invented for The Good Place. Fellow old man Luke Plunkett and I scratched our heads as our younger, cooler colleagues explained who Marshmello was to us over Slack, and even as I sighed at the whole idea and grimaced through a few of his videos on YouTube, I knew I had to check it out. Developer Epic Games seems to have done some good planning for the event, announcing policies for streamers and disabling weapons during the concert to prevent players from killing each other. A little before 2pm Eastern, I jumped into the only available mode besides Creative, which is called Showtime, and followed my squad to the flashing lights of Pleasant Park. The Showtime mode is a team-based mode with respawn where teams have to beat each other to 200 eliminations. But when I arrived at the arena, which has been being built in Fortnite all week, all I could do was watch the show. When the pre-show countdown ended, a glowing yellow light appeared on the stage, and eventually Marshmello blipped in behind his turntables. This was anti-climactic: Fortnite has released a Marshmello skin that mimics the musician’s trademark look, and a lot of players were wearing it. When the star of the show arrived, he was met by a horde of clones of himself. But there was something cool about it too, like he was just another player, or like every player could be him. Pre-recorded cheering played, and Marshmello shouted, “Let me see everybody moving!” The set began, the screen behind Marshmello exploding with light and colors as electronic music played. The most awkward but also most endearing part, for me, was Marshmello’s efforts to interact with the crowd. He encouraged players to dance, clap, and find their squads. He called us “Pleasant” the way a musician would shout out a real-world location, and I felt an unexpected sense of hometown pride, even though I have no strong feelings about Fortnite’s world besides the places least likely to get me killed. When Marshmello encouraged us to jump, the gravity in Pleasant Park swapped, catapulting me toward the stage in a trippy moment that would be impossible in the real world. “I want to see everyone doing their favorite emote right now!” Marshmello shouted later, not sounding at all awkward, and I found myself playing along so I didn’t look like a spoilsport. As far as I could tell players couldn’t get behind Marshmello’s virtual set-up, but there was a still a crowd of identical Marshmellos crammed as close as they could get to his avatar, dancing away. As the show went on, giant smiley face balls filled the arena for us to bounce with our pickaxes. 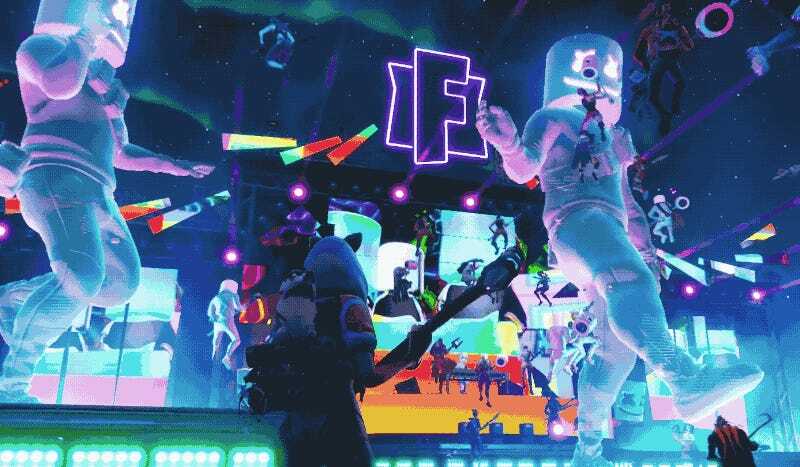 Holographic Cuddle Team Leaders and Marshmellos danced atop the stage and morphed around the arena. Everyone seemed to be having a good time, whether because there was nothing else to do or because they were actually enjoying it. Reader, I’m shocked and thrilled to say I enjoyed it too. The show was so hilarious, so strange and joyful in the way that Fortnite is, with goofily-dressed people doing their goofy moves and building towers into the sky. The music, God help me, was catchy as hell, and I even emote-danced along of my own volition. Marshmello referred repeatedly to “making history,” which could refer to either the size of the audience on their servers around the world or the idea of a concert in a video game. And it did feel special. From the crowd to the choice of star, the show felt like something that would only happen in Fortnite, but it wasn’t locked behind a paywall, level cap, or the need to own a certain brand of hardware. The fact that so many people of all ages and gaming skills could share in the moment together made it feel, paradoxically, precious. When the set ended, I was catapulted into the sky, where I fell back into the Showtime match. I landed near one of Fortnite’s giant pianos, which I’ve been needing to find to complete a challenge. As I puzzled over the music notes I needed to tap out, another player landed behind me and shotgunned me. I respawned, and Fortnite went on being Fortnite. I got back to the business of eliminating the other team, with the beats from the show still ringing in my head. 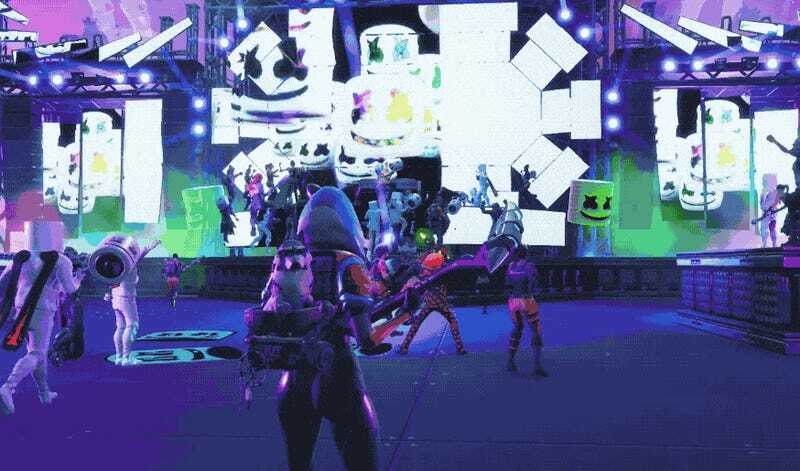 Update: 4:31pm—According to an in-game loading screen (and now a tweet by Marshmello), there will be an encore performance at 2am Eastern.